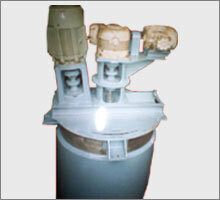 We are one of the leading manufacturers, exporters and suppliers of Twin Shaft Disperser. These are manufactured using quality materials and precision engineering techniques. Our range also complies with the international standards and is offered at competitive prices. The Twin shaft Variable Speed Dispersers Hydraulic Lifting that we manufacture are at par with the international quality standards. These are manufactured using quality materials and offered to our clients at industry leading prices. Twin Shaft Variable Speed Dispersers Hydraulic Lifting We manufacture Twin Shaft Variable Speed Dispersers Hydraulic Lifting with Tank. This is a highly versatile machine for the production of paints, inks, pharmaceuticals and other construction chemicals. These machines ensure proper breaking of agglomerates and can also mix various types of liquid in order to receive premium quality output.